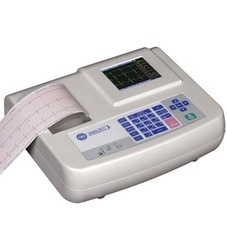 We are engaged in manufacturing and exporting a wide range of ECG Machines. Under this range, we provide Digital ECG Machine, 6 Channel ECG Machine, 12 Channel ECG Machine and 1 Channel ECG Machine. These products are widely appreciated by the customers for their excellent performance, easy handling and low maintenance. Apart from this, our products are designed and developed using high-grade raw material, which is sourced from the reliable vendors of the market. We also provide customization facility to customers as per their detailed specifications. We offer ECG machine which are used in medical check ups. These are useful screening tools for a variety of cardiac abnormalities. ECG machines are readily available in most medical facilities and the test is simple to perform, risk-free and inexpensive. *1-2-3 Touchscreen operation, with Philips DXL Algorithm, * AUTO (12 leads). *ECG Reports Format PDF or XML format. A4 Size paper. Simultaneneous 12 Lead ECG, Auto/Manual Mode.